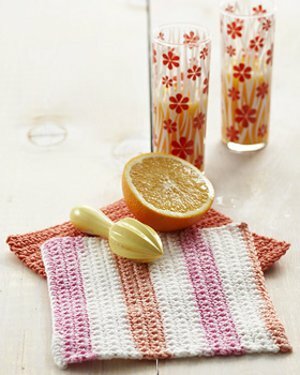 Get your kitchen ready for summer with this cute Pink Grapefruit Dishcloth. This beginner crochet pattern works up quickly and is a great way to practice your crochet skills. It's also a fun and easy way to practice changing colors. Make one or several in all your favorite bright summer colors. Gauge: 13 single crochets and 14 rows = 4 inches [10 centimeters]. Approx 8 inches [20.5 centimetres] square. Repeat last row until work from beginning measures 8 inches [20.5 centimeters]. This is just what I needed. Have been trying to teach a few friends how to crochet. I like to give them something easy that makes up quickly so they can see the fruits of their labors faster. This falls into that catagory. It's fast, very easy and when done they will have something to use and show off. Can you do this pattern by knitting it. Please send me a respond please. Greatly apprecaited.